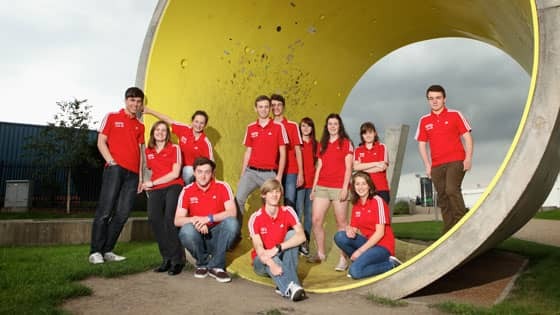 Everything you need to know about getting young people involved. We are proud to announce that Gosforth RC Go-Ride is now Clubmark accredited. Clubmark is the universally acknowledged cross sport accreditation scheme for community sports clubs.Thanks to coach Paul who has led on this project and has put a lot of hard work in. This year we had 2 hill climb events. Sixteen go-riders made the trip to Prospect Hill for the main club Hill Climb. Their results can be found here. They all did themselves proud and both the male and female youth records where broken. For the first time we also had a mini-hill-climb at Exhibition Park with 26 U12 riders taking part. 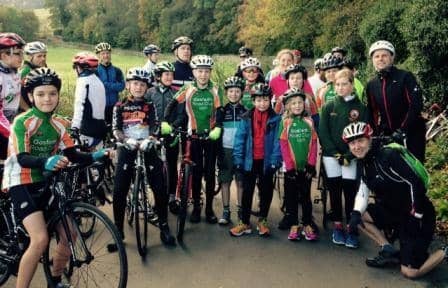 Thanks to coaches Ian and Rupert for organizing this which went down really well with our younger riders. Another great session at Manchester Velodrome. Thanks to the regional track coaches for all their input. Well done to the intrepid go-riders who took part in our epic 75mile ride on Wednesday. The weather was kind to us and everyone managed really well, especially as we ended up doing almost 80miles. 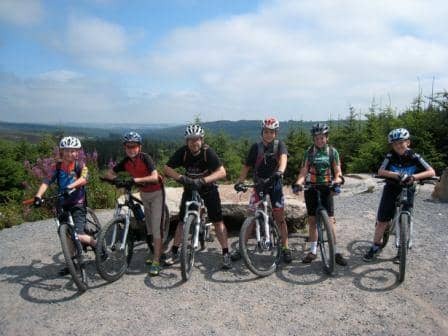 Another great day in the sun on the trails of Co Durham! 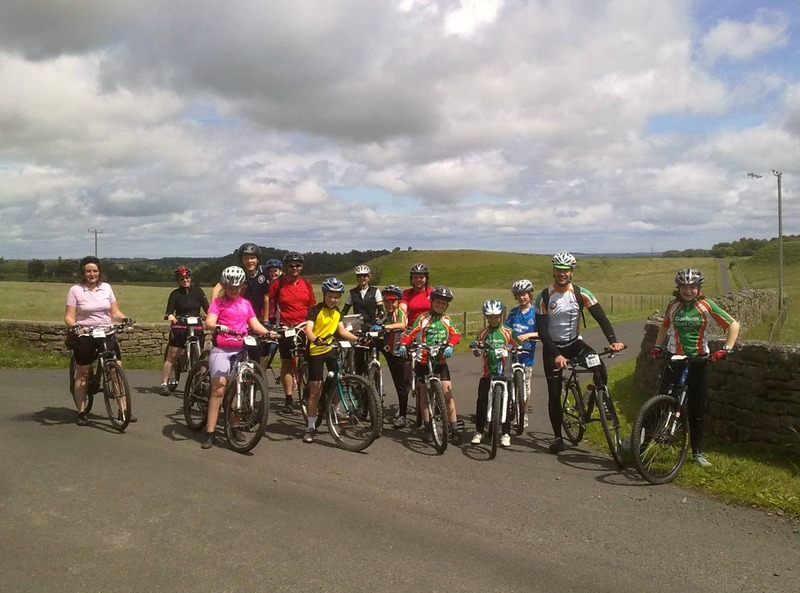 We had a great time this Saturday with our Go=Ride Le Tour event in preparation for the Tour de France in Yorkshire. The riders competed in 3 events: sprint, skills and hill climb. Winners of the indiviadual events were presented with green, white and polka-dot jerseys, the overall winner getting the coverted Malliot Jaune. Thanks to everyone who helped organise and run the event. 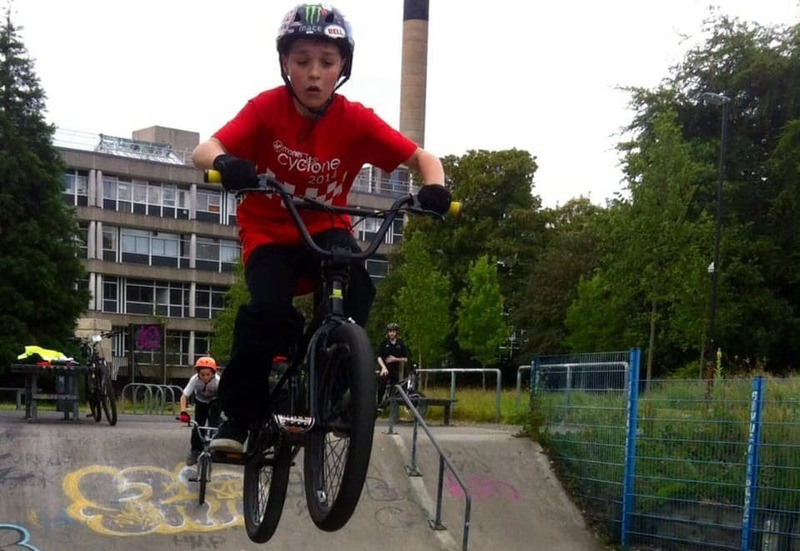 Thanks to Coach Ian for starting our new BMX sessions in Exhibition Park. They have been a great success and a real buzz for the young rigers involved. We hope to run these on the last Saturday of the month, pending coach availability. Well done to all those Go-Riders who took part in the Cyclone weekend. We had riders in the 6 Bridges Ride, the Crits and the Cyclone Challenge. Maybe we'll get riders in the Curlew Cup and the Beaumont Trophy in a few years? We had lots of riders take part in the Newcastle Big Ride this year, part of the Space4Cycling Campaign. Lots of us got to be in the paper too. It was a great turnout at the Hub on the Quayside. Thanks to everyone who came and the Coach Brian for organising the ride. 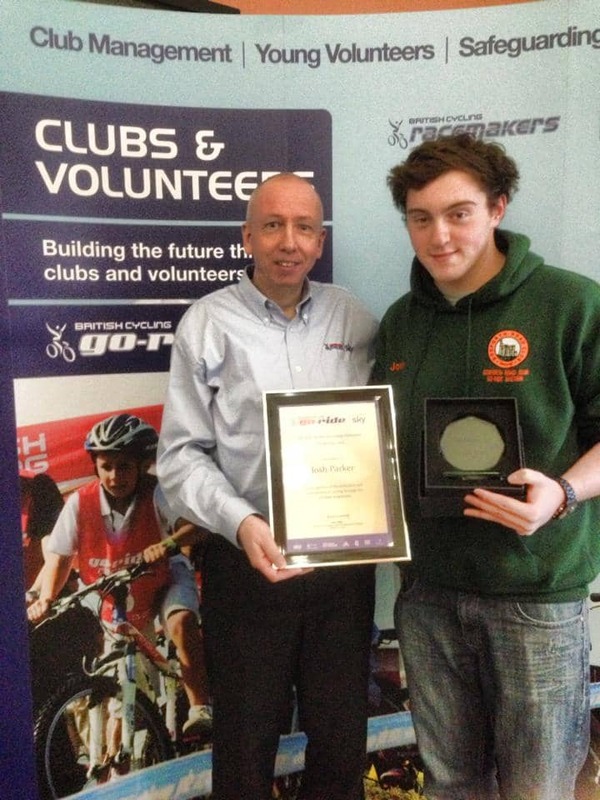 Congratulations to Josh Parker who is the British Cycling North East Young Volunteer of the Year! Josh has been volunteering at the club for the past few years, helping with coaching, setting up the facebook page, preparing certificates and the powerpoint presentation at last years club awards evening, and much more.He was given his award at the NE Go-Ride conference in Durham in front of coaches and volunteers from around the region. Congratulations to the winners, and we hope everyone who took part enjoyed it. Trophies will be awarded at the next club awards ceremony. Next year's competition will follow a similar format. 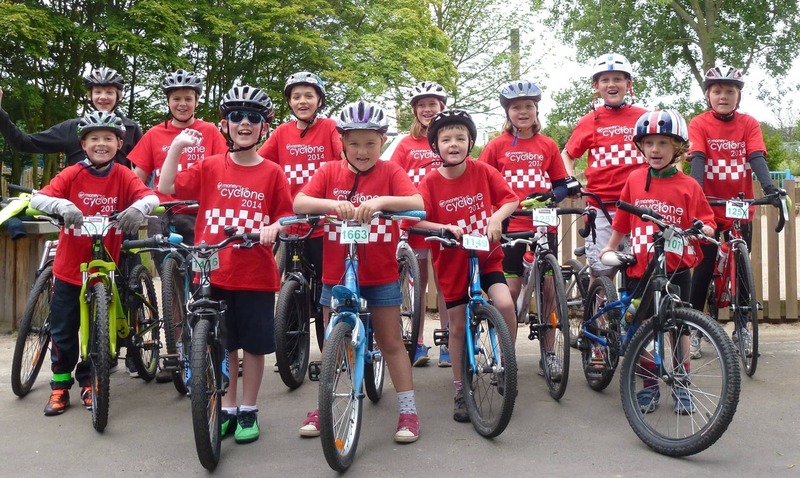 For the U12s three events will be organized at the park as well as the club hill climb and the leazes Crits, with each rider's 3 highest scores counting towards their total. 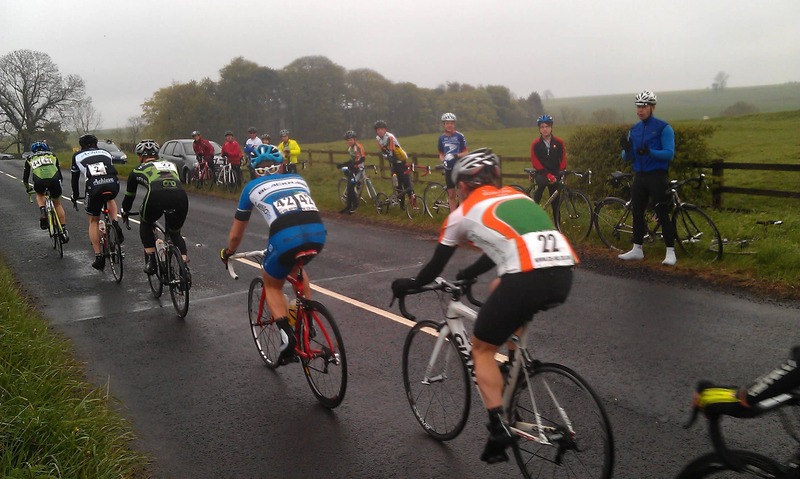 Well done to those hardy souls who took part in the club hill climb last week. Particuar mention has to go to Zeb Kyffin for smashing the fastest boy up the hill record by over a minute with a time of 5min 1sec. He also came 9th overall out of a field of 50. Eleanor Fletcher broke her own record from last year to be the fastest girl up the hill and Alice Drought did amazingly well to get to the top at the tender age of 8 which means she is now the unbeatable leader of the Girls U12 BAR. 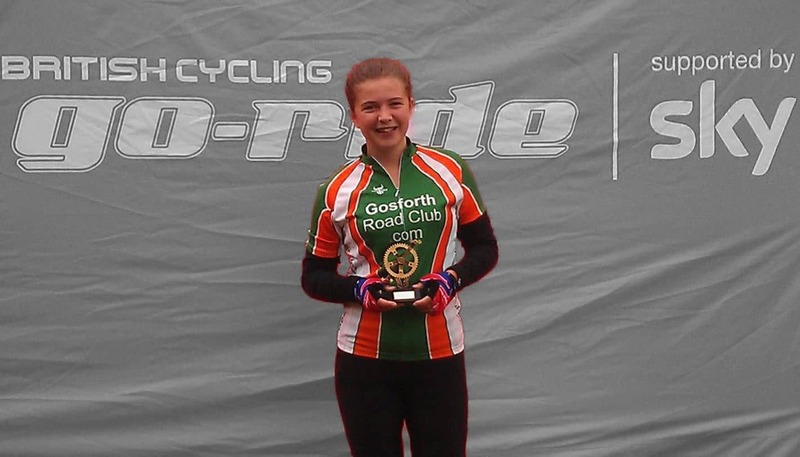 Congratulations to Sophie is now the U16 girls NE XC MTB Champion. She was awarded the trophy at the final event in the series at Hamsterley Forest. She will shortly be joining the rest of the NE team at the BC Inter Regional Championships at the Olympic course at Hadleigh Farm. We wish her a the team well. We are also pleased to announce that our local Breeze partners will be running social bike rides for women from Exhibition Park every Saturday till half term to co-incide with the coaching sessions. Lots of us had a great day out on the Quayside. 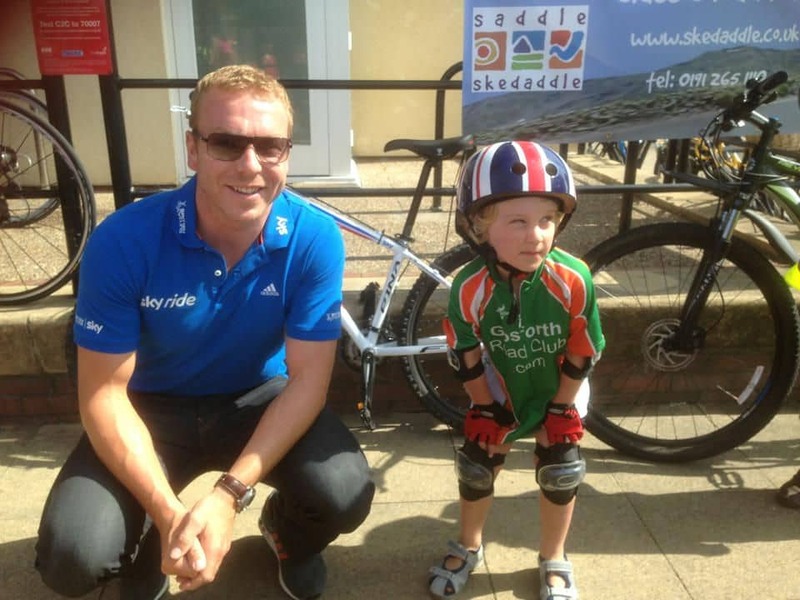 Coach Mark was there in his official capacity as Skyride leader, and Jake and Joe met Sir Chris Hoy! Another great turnout, another great day, and don't they look smart? Great fun and what a cracking backdrop! A great day out in the sunshine and it was nice to see a few new faces. We started and finished at the Hub, followed the Hadrian Way to Newburn then the Keelmans Way back. The ride was followed by burgers, pasta and cake, then the presentation. Thanks to Ian for his talk, Josh for visuals, Peter for presenting the prizes and Carlton for sorting the venue and food. Josh Reid won the male BAR but well done to little Joe Taylor who came 2nd and Nyal Horner 3rd. The female BAR was much more tightly fought with only 2 points seperating the top 3 riders. Well done to Sophie Smith who won, closely followed by Eleanor Fletchor in 2nd and Erin Riley in 3rd place. We hope to get the 2013 BAR going as soon as possible to avoid events being delayed by the weather again, so watch this space. Also this has been the first year we've run the event so expect some refinements to the format for next year. Well done to Josh, Sophie, Eleanor, Zeb and Erin who battled in the wind and mud at Gateshead this morning in the NE CX Championships. They all did really well in testing conditions. The event was also part of our junior BAR competition and being the highest placed GRC rider Josh Reid is now unbeatable and can be crowned male BAR. Well done Josh! Another successful trip to the velodrome. We are delighted to announce that Josh Reid has now progressed to the green group and hopes to go for track accreditation later in the year. It may have been cold, wet and miserable but we managed to get ourselves out of the cars and ready to set off into the rain. Within minutes of leaving the carpark Carlton's pedal had fallen off twice and so we were down to seven! We battled up the hill past Whitton Tower and then up Simonside herself. The wind was strong and in our faces but we finally made it to the top of Whitefield Hill. "Are we going to do any proper mountain biking?" asked Josh. 20mins later at the bottom of the descent in Hepple everyone was buzzing and smiling, even Josh! As with all well planned rides the wind was behind us as we made our way home. The sun even popped out! The only downer was the miriad thorns that the farmer had kindly spread across the road resulting in countless punctures. It didn't dent our spirits though as we made our way to the cafe for some homemade soup! 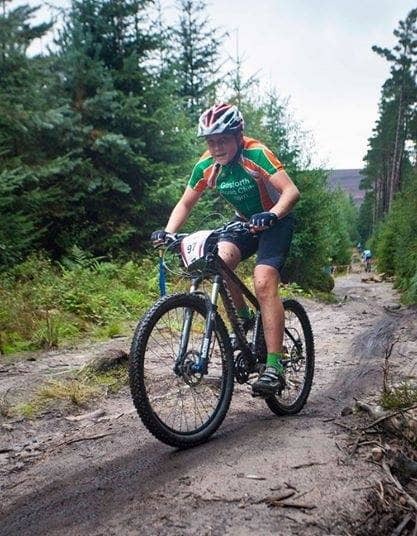 Well done to everyone who took part in our MTB race, especially Josh Reid who was the fastest round the course with a time of 1min 21secs (beating all the coaches as well!). James Corfield and Sam Stoner came joint second with a time of 1min 50secs, narrowly beating Sophie Smith (fastest female) who completed the course in 1min 51secs. Joe Taylor was the fastest on the shorter course. 8 young riders and 5 adults turned out on a wild and windy day for our Halloween Ride. The wind never quite seemed to be in our faces and we managed to stay dry. The girls won the fancy dress prize, but Ozzie's Batman shades were a tough act to beat. Interesting cafe stop, but the cake was worth the wait. Well done to all our riders who went out to the Hill Climb on Saturday and made it up the hill. Special mention must go to Joe Taylor who at 7yrs of age made it all the way up the hill without stopping! Congratulations to Josh reid who was the fastest Go-Rider up the hill, beating last year's winner Joe Kirtley by 14seconds. 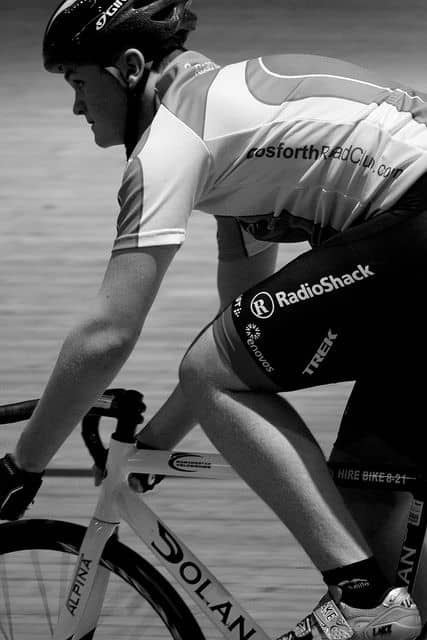 Josh also takes the Go-Ride record, beating Josh Parkers 2010 time by 2 secs. Congratulations also to Eleanor Fletcher who was the fastest female Go-Rider. This was the first time we've had female Go-Riders in the event and is a great development for the club. 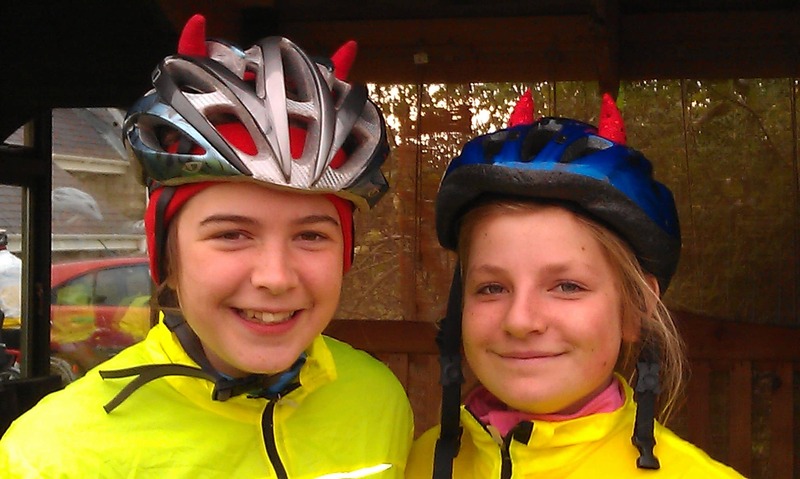 Well done to Sophie who was selected for the North East Squad in the British Cycling Inter Regional MTB Championships. The event was held over 3 days at Hadleigh Farm, Essex (the London 2012 MTB Course). The team were competing against the top young riders in the UK and came a creditable 9th out of 14 regions. Huge thanks to Dan Small for organising a great trip to Manchester Velodrome. 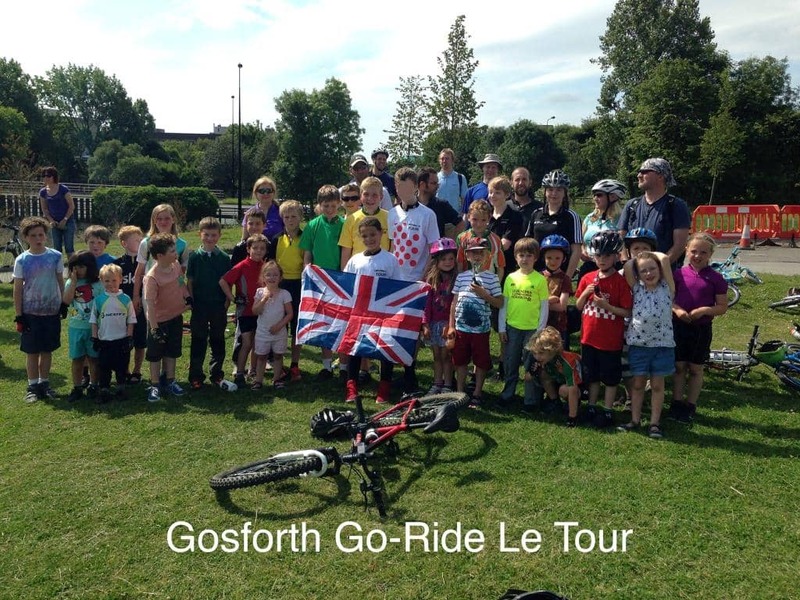 Gosforth RC took 8 youngsters who joined riders from all the Go-Ride clubs in the North East Region. The sessions were expertly run with riders being split on ability and getting lots quality track time. Everyone progressed and we are looking forward to the next session. 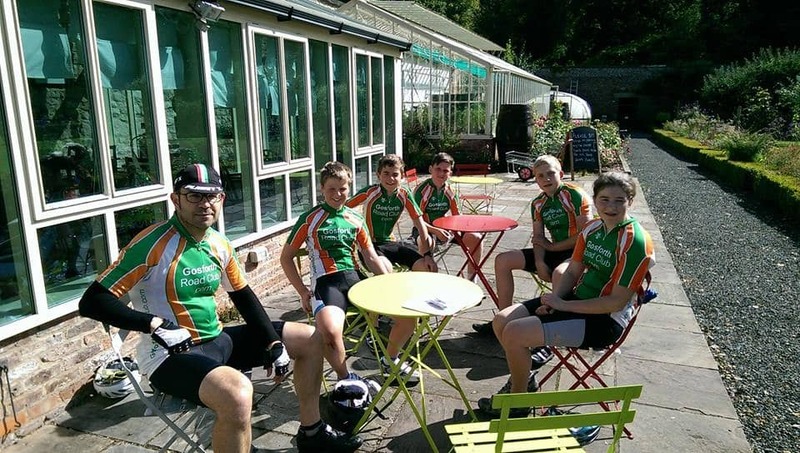 On the first 4 Wednesdays of the summer holidays this year we had a junior club ride. The rides alternated Road and Mountain bike. 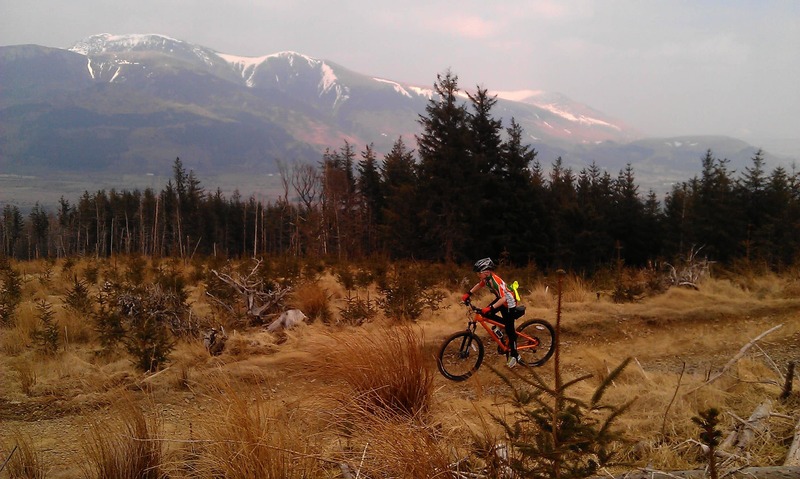 We were blessed with good weather on all the days and enjoyed road rides to Gubeon and Matfen as well as visits to Kielder and Hamsterley MTB Trail Centres. Look in the Gallery oposite for photos. We had an excellent turnout for the Kielder trip with a total of 17 riders setting off around the lake. Initially all went well and the sun shone on us as we visited the various art works. 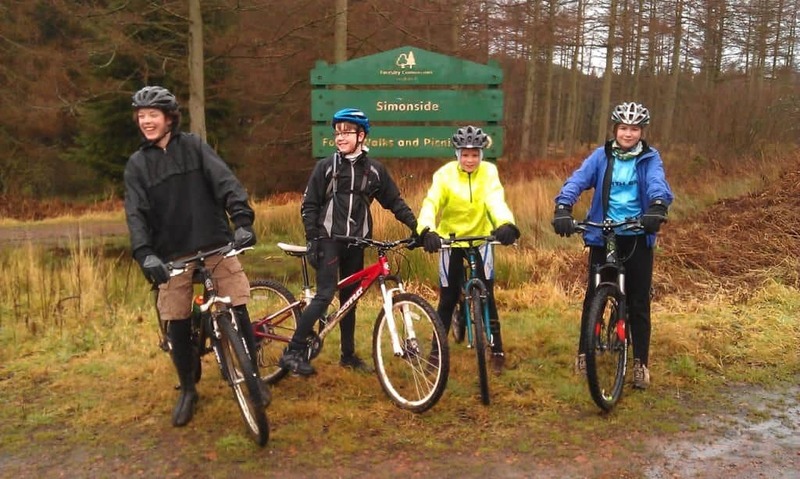 A group of 9 adventurous souls climbed up through the forest to ride some of the singletrack on the Osprey Trail and then we all had lunch at Kielder Castle. Unfortunately at that point the heavens opened and torrential rain put a bit of a damper on the rest of the day, but everyone seemed to have had a fun day out. 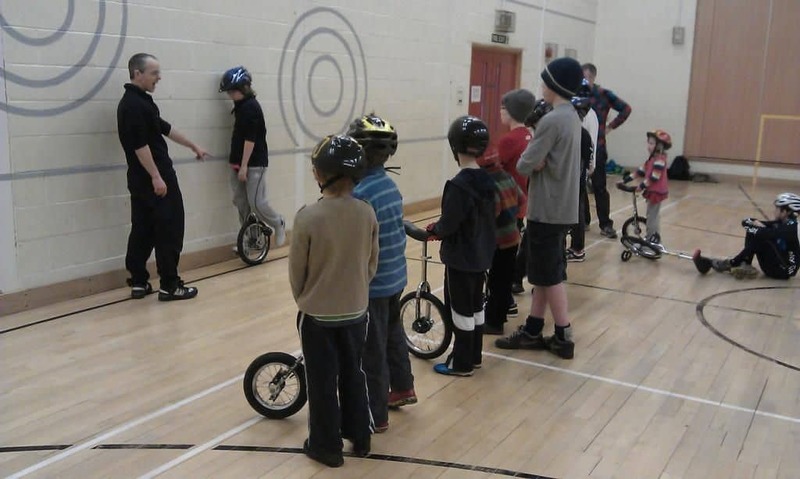 A huge thank-you to Carlton for arranging and running last weeks unicycling session at St Catherines. It was a great turn-out and everyone seemed to have a really good time, including all the Dads! Hopefully we might be able to repeat the session again in the future if there is the demand. A trip to the Gate to see Tin-Tin followed by a McDonald's. What more could you ask for a great night out! Once again we had a good turn-out for this event, with five youth entries and one coach riding. Well done to everyone for getting to the top, but special praise to Joe Kirtley, the fastest youth up the hill, winner of the new GRC Hill Climb Youth Trophy. 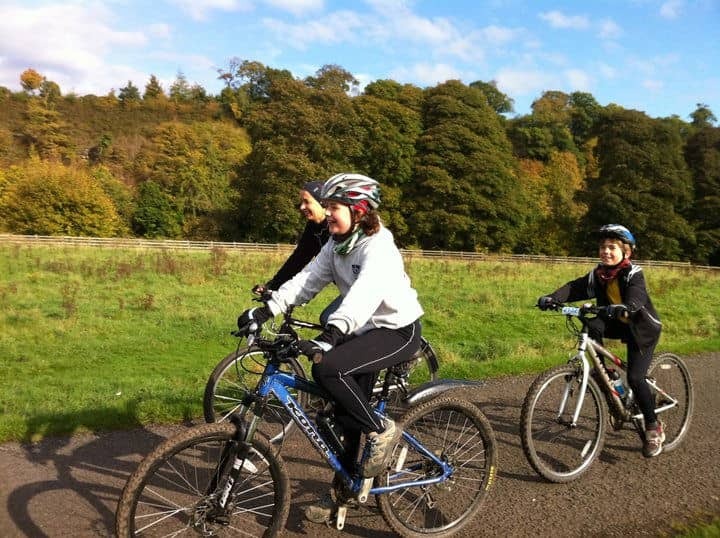 Another fine day out riding down the Derwent Valley to Gibside which had opened up it's grounds for one day only to allow cyclists to sample the delights of this National Trust owned country estate. The sun shone and we made the most of the riding, as well as the 'Low ropes course'. Well done to Zeb, Ben, Josh and Josh for their tremendous performance in the Cyclone Challenge: Ben being fastest in his age cat and Josh and Zeb coming first and second in theirs. The rest of us also had a great day out, taking our time and eating lots of cake along the way. 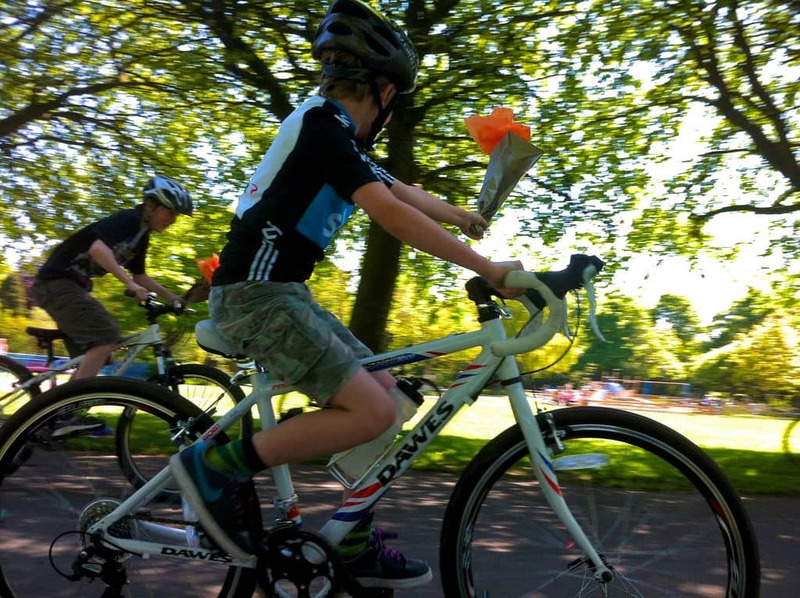 What a fantastic turn-out we had for our spring family ride on Easter Monday. 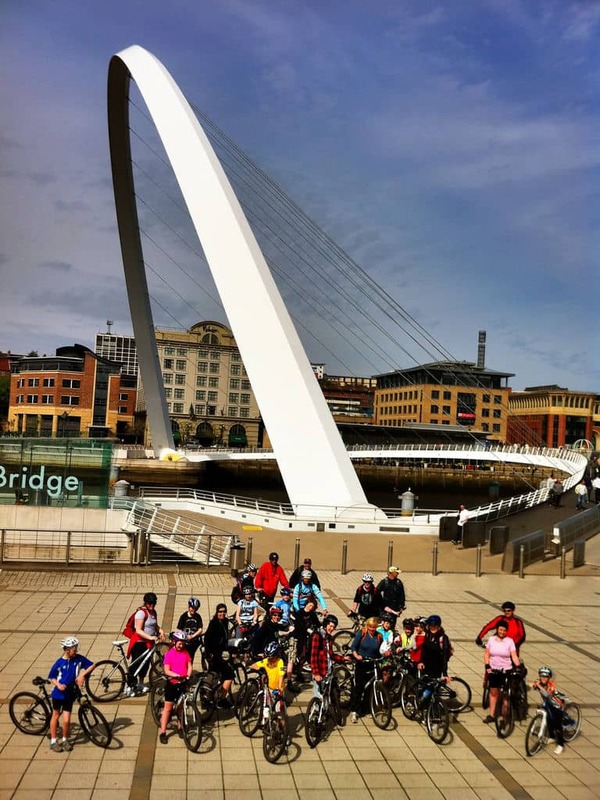 27 of us met at the Millenium Bridge on the Quayside and rode along the C2C route to the Tyne cycle tunnel. After a number of ups and downs in the lift we cycled under the river, an long held ambition for me, and a far more pleasant experience than cycling through the Clyde cycle tunnel the weekend before. At the southern end of the tunnel we had a picnic by the river and the obligatory games of tag were had. We then returned along the south side of the river, a round trip of 15miles. The weather was good and by the smiles on everyones faces it seemed that a good time was had by all. We rounded it off with an ice cream before cycling home. Thanks to everyone who came along. 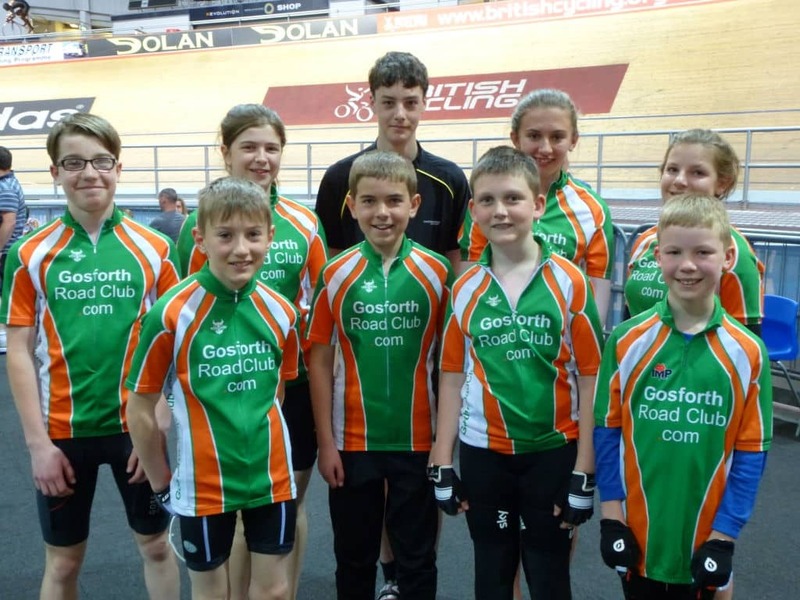 This was the Go-Ride section's first trip to the National Cycling Centre, Manchester. 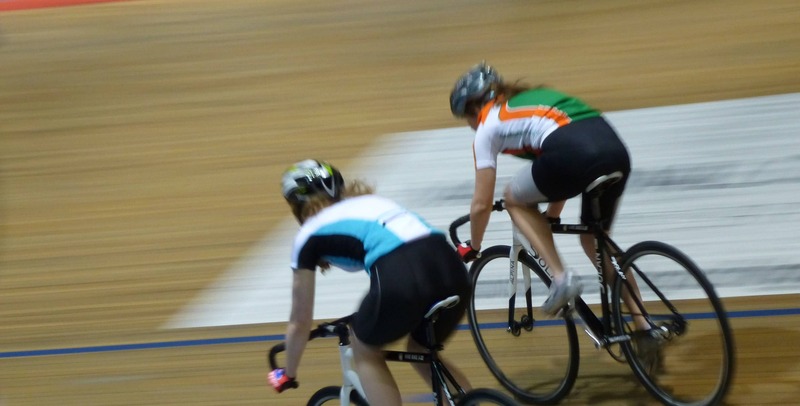 Nine young riders joined the ranks of the senior club to ride the famous indoor track. 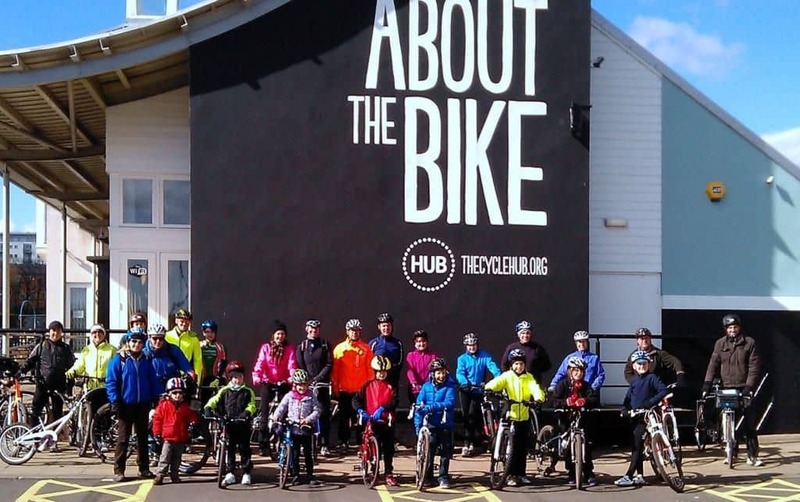 At first the steep banking looks daunting and the fixed wheel and no brake bikes also take a bit of getting used to, but after some expert coaching from the club's own track coach Russ we all got the hang of it and were wizzing round like Chris Hoy! We all had a great day out, with most people bringing the family to watch. I suspect we'll have more wanting to ride next time. The session finished with a one-lap flying-start time trial. Thanks to everyone who turned up for our trip to see the latest Narnia film. We had over 30 people in the end, and you all looked smart in your 3D specs! It was good to enjoy each others company in Gekko afterwards as well. That was the last time we'll meet up before Christmas so can we wish all our members and their families a very Happy Christmas, and we'll see you all again in the new year at the first coaching session of 2011 on Saturday 8th January. We had a great time this saturday. The snow may have gone but it left the paths across the Moor submerged by new lakes and rivers. 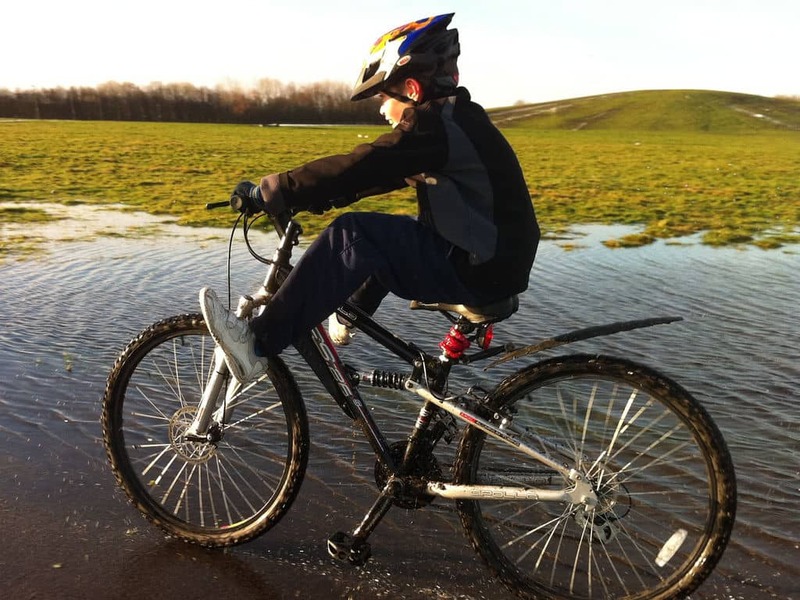 We decided to run a session on riding through water and everyone had great fun. We had a great day on the family bike ride. The weather was kind to us, especially during our picnic in the park at Ovingham. It's the first bike ride where I've needed my helmet on during the lunch stop...thanks to the 'shoe game'! Ice cream and cups of tea at George Stephenson's cottage on the way home, shame George wasn't in though. Looking forward to the next ride already. Well done to Ben, Josh and Josh who all did remarkably well in the club hill climb. Ben even beat his Dad! Grrhh!